At the beginning of August, our friend Jenny gave Yulia and I a pile of her old boyfriend’s workout equipment. She is moving, and is getting rid of anything she can. Yulia and I were talking just the week before on how lousy it was that we didn’t make better use of the space in the office off of our bedroom. One of the comments that she made was it would be nice to have a space to workout at home in. Well, with Jenny offering a bunch of equipment, this seemed like a great chance to change something for the better. I got a curling bar, plates, and a bench from Jenny. I took the easy chair out of the office, and moved the equipment into that corner. 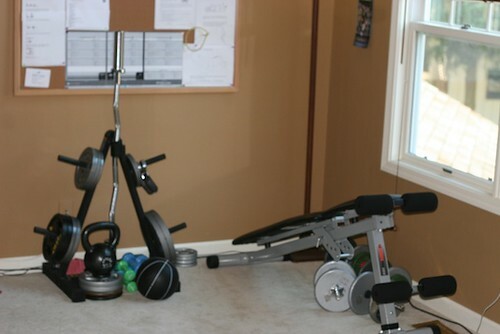 Then I went around the house and collected all the random home equipment that we had, which included a few light dumbbells, elastic straps for stretching, and a swiss ball. I went to the store and picked up a 12 pound medicine ball, and some dumbbell handles for the smaller plates. We also got a pull-up bar for the closet. Now, I have started adding kettlebell exercises as well, with a 35 pound kettlebell, and have more workouts added from ideas I got from Gymjones.com. Yulia got the P90x program, which includes a diet plan and 12 exercise DVDs. I tried a few and they are tough!